Hi all, it’s your editor here. Firstly, huge thanks to all who have pre-ordered the next issue, number 49! 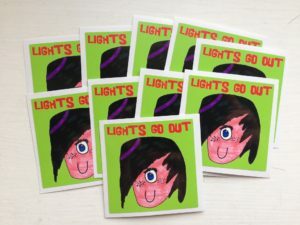 Crazy to think that we’ve nearly hit 50 issues of Lights Go Out! Just for the record I won’t be doing anything special when we hit 50 issues, maybe if/when we hit 100 issues we’ll have a think about some kind of special. The great news is that we’ve been told that there’s going to be a whole series of stickers that she’ll be designing for us, this is just the first! (Shhh, we have seen the next one and it’s really cool too!). So please do order the zine, get a sticker, the sooner we run out of stock, the sooner we can get the next design on order. You can get your order in for the new issue HERE – thanks!